Two competing services forming one site. 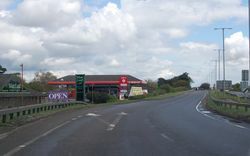 There are roundabouts both directions from the sites so either can be accessed when heading to or from the A1. The services are really in two distinct halves, although traffic can use either. They don't appear to have official names but 'Newark Road' is the one on the A46 and 'Winthorpe' is the one in the corner. The services were built by Top Rank in the late 1980s, as part of an experiment to try catching traffic with smaller facilities on A-roads. In 1992, Top Rank were bought by Pavilion, but the company were worried about their finances and looked to sell off the least-profitable sites. With that, the services were sold to Trusthouse Forte, who decided to convert the building to a large Happy Eater. The next year Forte were taken over by Granada who converted the restaurant to a Little ChefHistory and Burger King. Those restaurants had closed by 2006 and the building was purchased by a restaurant. In 2012 the filling station was sold by previous owners TCS to Shell. 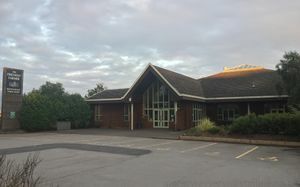 During early 2018, it underwent refurbishment and is now operated by Waitrose with a Little Waitrose store. The restaurant here was opened by AJ's, rivalling the existing services. In 1998 it was converted by Granada to a Little Chef, which then closed in 2005. The filling station was formerly branded as Jet, and before that Murco and is now operated by MFG.